The 'Gem of Orissan Architecture' is the only phrase that goes well with Mukteswara Temple. Located in Bhubaneshwar, Mukteshwara Mandir is the best temple in the capital city of Orissa. 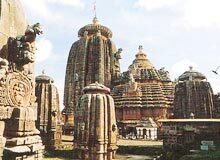 The architectural temple can be reached easily from Bhubaneshwar, which is well-connected to other cities by air, rail and road. Built in 950 A.D, Mukteswara temple is literally a dream realized in sandstone. The temple is said to be the structure, where sculpture and architecture are in synchronization with one another.